Leading 100% Export Oriented Unit of anti rabies vaccine from Surat. We Salvavidas Pharmaceutical Pvt Ltd are a leading Manufacturer and Exporter of Anti Rabies Vaccine in different strength and packing. Our manufacturing facility is certified with WHO-GMP. We are a well-known firm engaged in trading and supplying of superior quality Anti Rabies Vaccine. 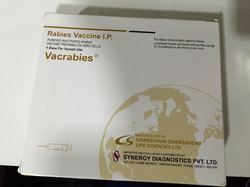 Effective in providing prevention against Rabies, this Rabies vaccine is accurately processed as per the set medical norms by using advance technology and optimum quality chemicals procured from the most trusted vendors of the market. Along with that, to assure supreme quality, our Rabies vaccine is perfectly checked on every stage of formulation under the observation of accomplished professionals.